Worldwide, management systems invest strongly on the concepts of innovation and creativity, two pillars necessary for the advancement of any modern economy. These two concepts play a strategic role in the evolution of any organization, defining its competitive advantages and thus securing its future survival. 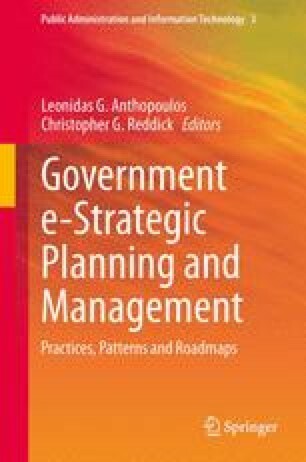 Here, in this chapter, we examine them in the light of the public sector and especially in the area of educational organizations management. We investigate under which circumstances they emerge, how they flourish or fail, and what impact they have on the daily operations of a PSEO. These concepts are dynamic, so the corresponding phenomena are discussed using analytical as well as discrete methodologies. We focus our attention on policies and strategies developed by the public sector, in the frame of e-government initiatives, so as to prepare the organizations for competition in the digital future. Finally, we propose a methodology appropriate for transforming a typical conservative PSEO into a modern, innovation-endorsing, and sustainable business model. It is important to aim at and describe in detail a step-by-step process that leads smoothly to the new situation, avoiding incongruities and disruptions. This is depicted in a roadmap sketched using the basic concepts embedded on a transition diagram. The work ends by wrapping up a psychological profile appropriate to cultivate to all PSEO stakeholders, in order to manage to administer changes of this magnitude and importance. Acronym for “Public Sector Educational Organization”. EU Report (2010). EU Budget 2009: Financial Report. Publication Office of the EU. http://ec.europa.eu/budget/index.htm. Accessed 12 Sept 2012. OECD (2011). Education at a Glance 2011, OECD indicators. http://www.oecd.org/education/highereducationandadultlearning/48631582.pdf. Accessed 18 Sept 2012.